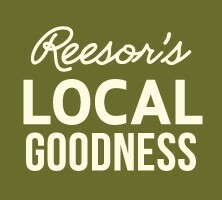 Reesor's Local Goodness – Page 2 – Featuring all of the latest Reesor's Market & Bakery News and Recipes! 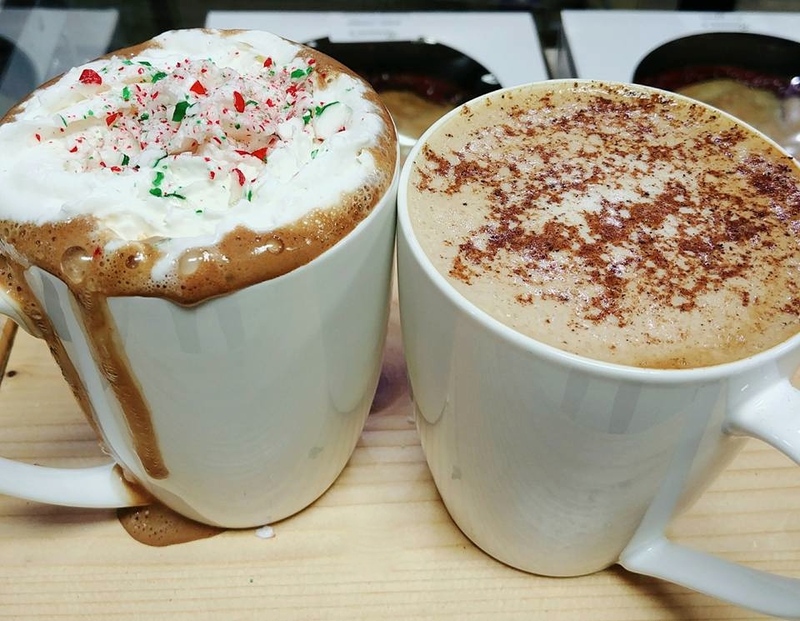 ‘Tis the season for treating yourself to a delicious holiday drink at our To-Go Café. We’ve got Jingle Bell Rock (peppermint mocha), Nutcracker (eggnog latte) pictured above, plus there is Blue Christmas (peppermint hot chocolate) or Oh Christmas Tea (holiday chai latte). Our café is open Mon.-Sat. 8-3pm. Is it lunchtime yet? 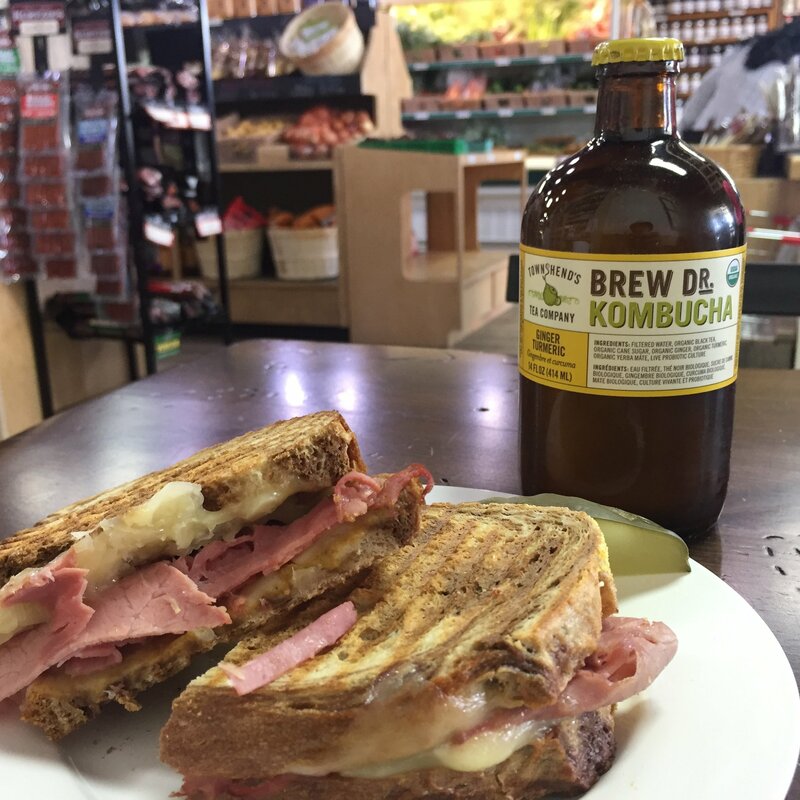 Try a delicious Reuben panini and a bottle of the latest beverage trend, kombucha. 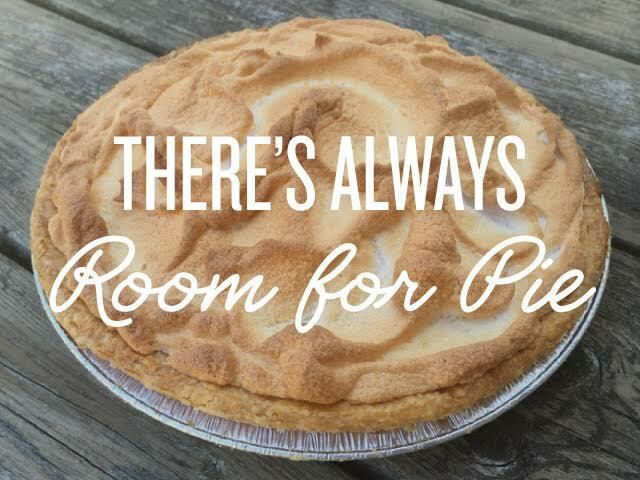 Enjoy our gourmet deli meats, Ontario and Quebec cheese, fresh and frozen soups, entrées, fruit cake and loads of pies, including lemon meringue, pecan, pumpkin, caramel apple and our famous fruit pies. We have lots of baking available every day. But if you want particular pies or cookies for Christmas day, please call 905-640-2270 and order by Thurs., Dec. 21 to avoid disappointment. Check out our Christmas baking list to see the 14 kinds of Christmas cookies we’re making this year (including gluten free shortbread). 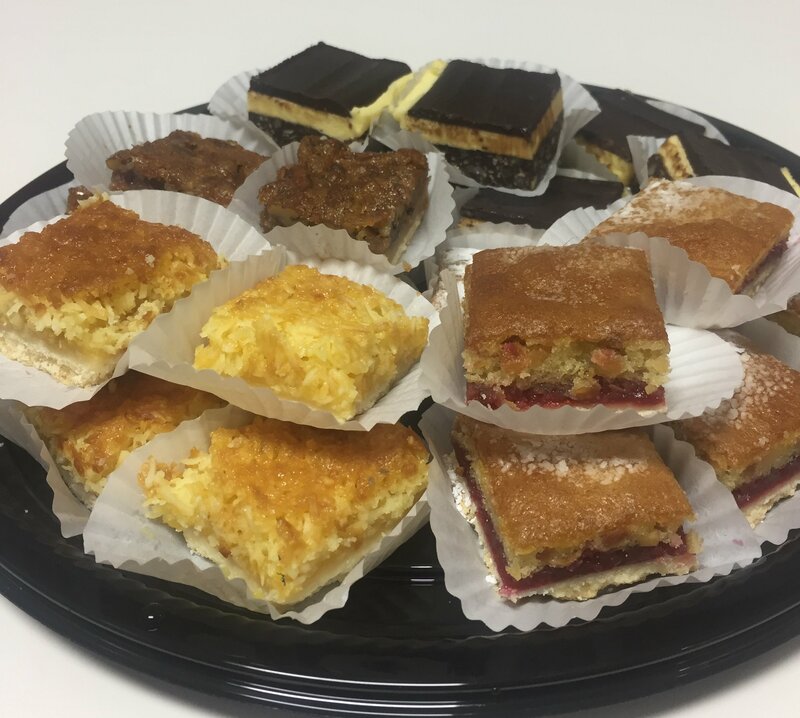 You can buy them by the package and we offer trays of mixed squares. 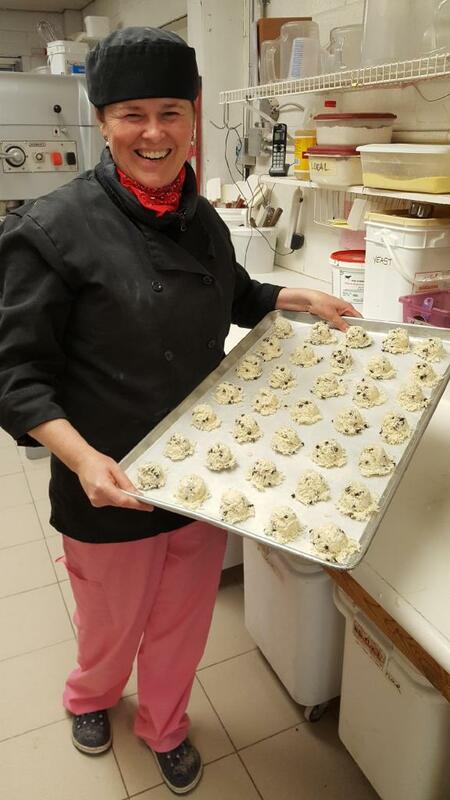 One of our bakers, Pam, getting a tray of our made from scratch chocolate chip coconut macaroons into the oven. 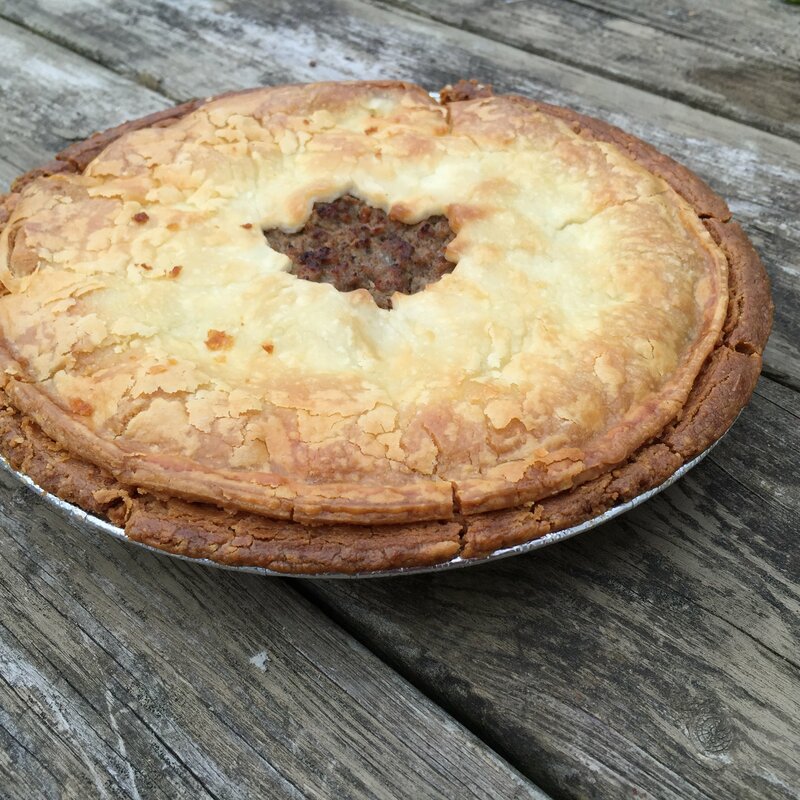 Try our Quebec style tourtière, a delicious blend of beef, pork, onion and spices. 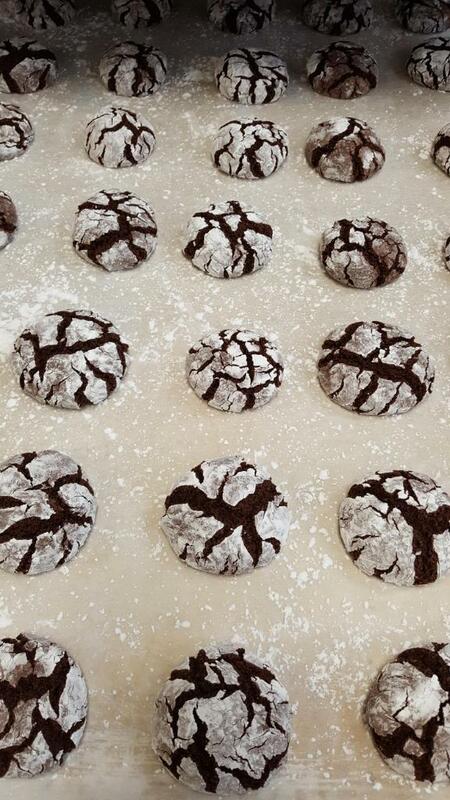 Fudgy Chocolate Crinkle Cookies, one of the classic Christmas cookies we’re making this year. 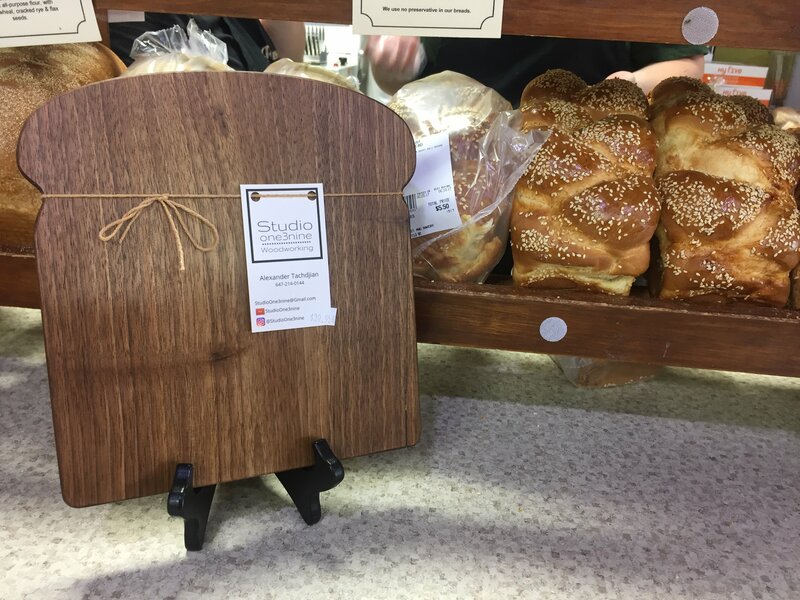 New this year are gorgeous, handmade, hardwood bread boards made by young Stouffville woodworker Alex Tachdjian. He makes them in various shapes, sizes and combinations of maple and walnut. It’s that chocolate time of year! 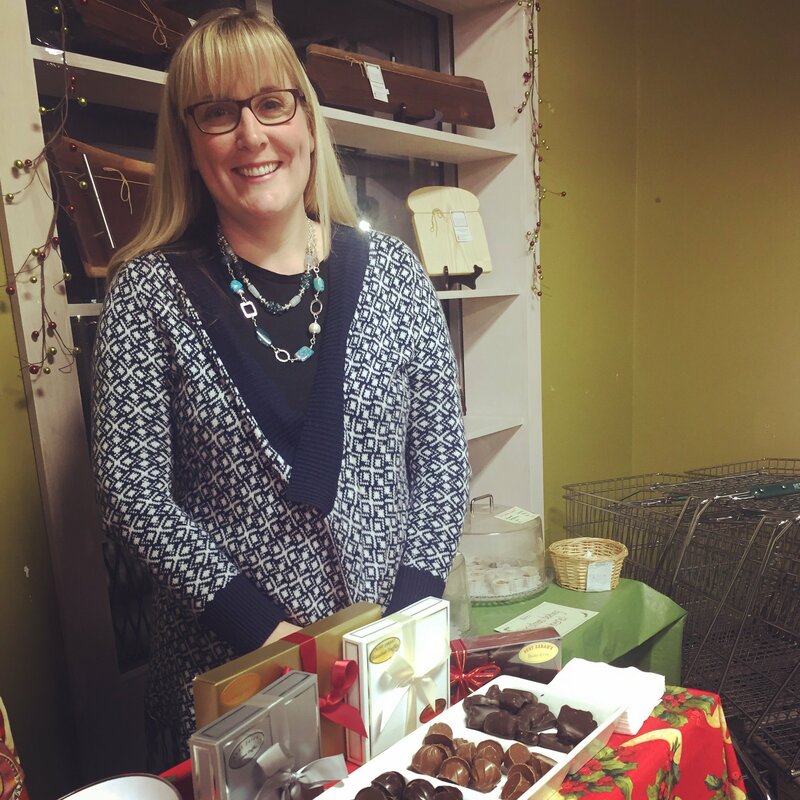 New at Reesor’s this year are Belgian chocolates made by Aunt Sarah’s of Thornhill. 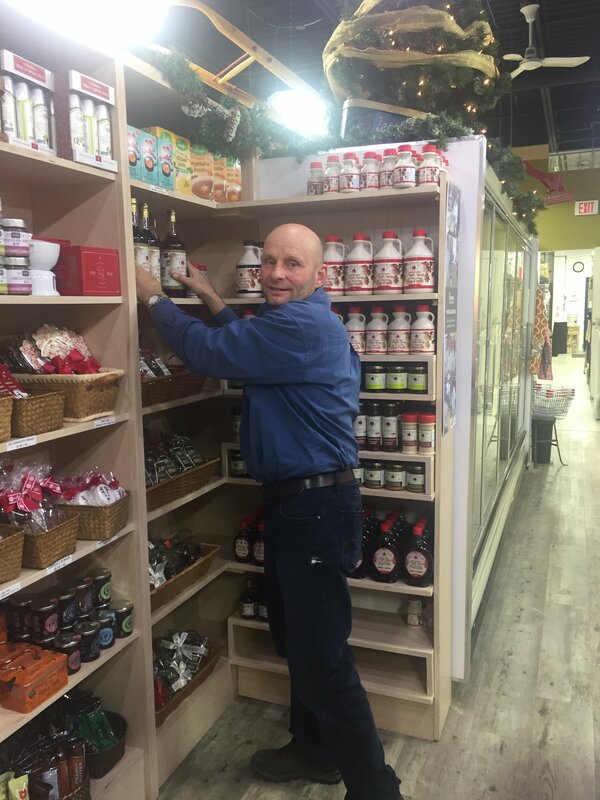 Everyone who has been tasting the samples brought to us by Erin Brazier the daughter of chocolatier Peter Brazer has been loving them. There are boxed chocolates, bark and bars. Can’t decide what to put in a gift box? We offer gift certificates in any amount, so your family and friends can choose their own favourite foods. Underneath this biodegradable mulch little sweet corn and green bean seedlings are thriving. Reesor’s Farm Market will open for the season on Thurs. June 8th at 9:00 a.m. Summer isn’t far away! Our bakers are pulling out all the stops this week with lots of chocolate for you and your mom. Turtle Cake–a chocolate layer cake with rich caramel sauce between the layers, chocolate frosting and pecans embedded on the sides. Hummingbird Cake–banana layer cake with pineapple, coconut, pecans and cream cheese frosting. Nutella Swirl Buns–our week-end Cinnamon Buns made with Nutella and no cinnamon. They were a hit at Easter. We have cream puffs! They are tender puffs filled with pastry cream that has been gently mixed with whipped cream and then dipped in chocolate. You can place your order for any of our baking by calling us at 905-640-2270. Fresh flowers will brighten your mother’s day! Jay selected lots of beautiful cut flowers and hanging patio baskets this week for you to give your mom or to brighten up your own home. Maybe there’s someone who is like a mother to you who will be happy to see you and your gift of flowers. Ever wonder what is on a farmer’s to do list in mid-April? Just in case you’re interested, here is what is on our list for the next few weeks. This was the winter of flat tires, so we called in the tire repair guys to fix two flats on two different tractors and replace our cultivator’s tires. Then we have to replace the points on some of the cultivator shanks as they are worn out. Next we have to get the corn planter out and make sure everything is working well to get the seeds planted at just the right depth and properly firmed into the soil. Next priority is to make sure all the oil and filters are changed on the tractors and all of the equipment is greased and ready to go when we get a sunny, dry day. As well, any day now we need to take the straw off the strawberries with a small tractor and rake and then walk the entire field to touch up any areas that the machine didn’t do well. Yep. It’s going to be a busy few weeks! I wish each of our readers a wonderful spring season! Jay was serving up free coffee at Reesor’s Market & Bakery recent open house.